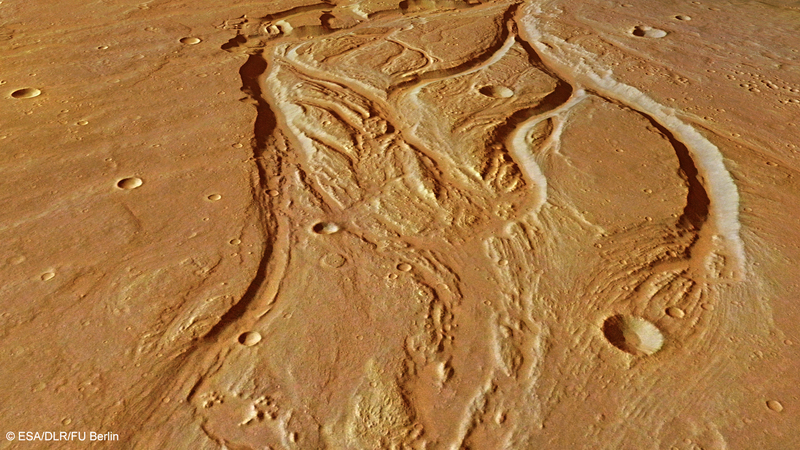 Catastrophic flooding is thought to have created the heavily eroded Osuga Valles on Mars … and the features within it. 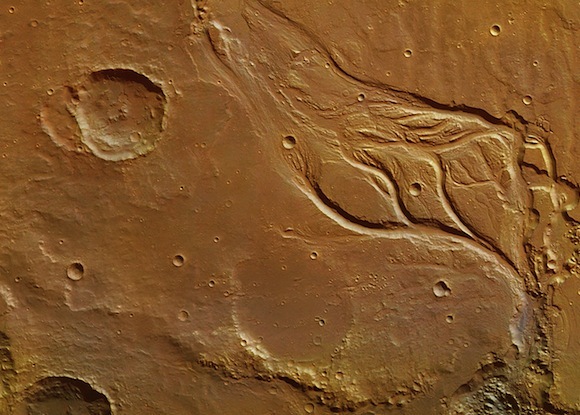 Images captured on December 7, 2013 by ESA’s Mars Express show the central portion of Osuga Valles, which has a total length of 164 kilometers. It is some 170 kilometers south of Eos Chaos, which lies in the far eastern section of Valles Marineris. Osuga Valles is an outflow channel that emanates from a region of chaotic terrain at the edge of Eos Chaos to the west (top in the main images). 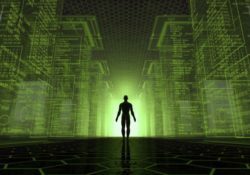 Such landscape is dominated by randomly oriented and heavily eroded blocks of terrain. Another example is seen at the bottom of this scene, filling the 2.5 kilometer-deep depression into which Osuga Valles empties. Catastrophic flooding is thought to have created the heavily eroded Osuga Valles and the features within it. 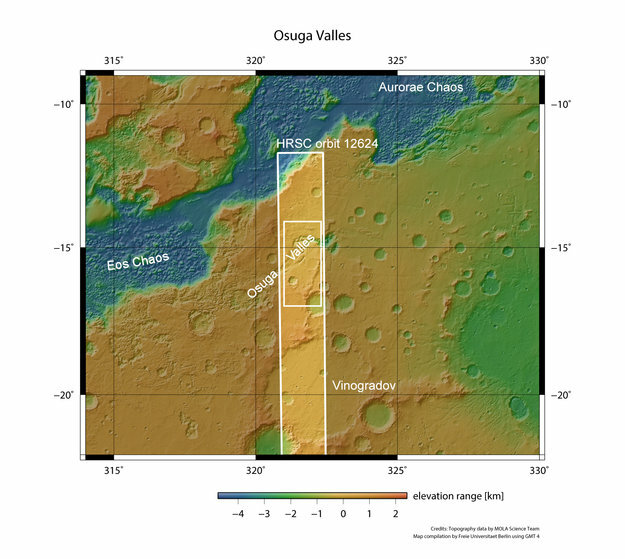 Streamlines around the islands in the valley indicate that the direction of flow was towards the northeast (bottom right in the main color, topographic and 3D images shown here) and sets of parallel, narrow grooves on the floor of the channel suggest that the water was fast flowing. Differences in elevation within the feature, along with the presence and cross-cutting relationships of channels carved onto the islands, suggest that Osuga Valles experienced several episodes of flooding. The perspective view, which is oriented with the direction of the water flow towards the top of the image, shows the details of the grooved valley floor and the channels carved into the islands more clearly. Close to the northern-most (far right) part of the channel in the main images, two large irregular-shaped blocks appear to have broken away from the surrounding terrain, but do not seem to have experienced as much erosion as the rounded islands. The floodwater eventually emptied into the deep depression of chaotic terrain at the bottom of the main images, but it is not yet known whether the water drained away into the subsurface or formed a temporary lake.